​This building is no chocolate box cover, nor is it imbued with old world charm. In fact superficially it looks a bit of a mess. But of all the beautiful buildings in our town, so rich in beautiful buildings, it is the one that never fails to lift my spirits in a way that others I admire don’t; and I see it on an almost daily basis. 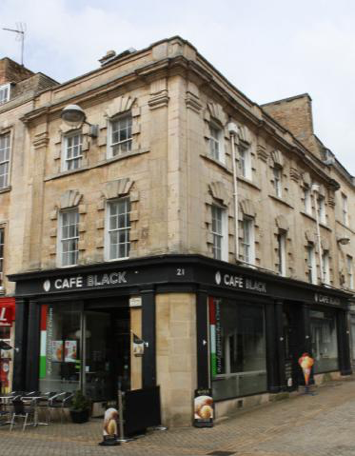 It occupies a pivotal site on the corner of the High Street and Ironmonger Street, and is occupied at present by Café Black. This is an important focal point where the two wide streets meet, while looking from Broad Street the two corner buildings form an attractive frame to the tower of St Michael’s Church on the High Street. popular and readily available architectural pattern books such as those written by Batty Langley, whose prolific output included over 20 books in 20 years. The Roman author and civil engineer Vitruvius, writing in the first century BC, was the first to produce an architectural manual “The Ten Books of Architecture”. In each book he considers different aspects of building from basic materials, to topics such as symmetry, proportion and the role of geometry. Ever since his followers have deliberately or unknowingly based their works on his ideas, and many have felt confident enough to then play around with them. Our building was probably erected by a Mr Portwood who was the leading builder and master mason in Stamford from about 1725-1740. Like many Georgian buildings ours displays the builder’s ability to make things, with the help of a good pattern book, look just right. The sharply projecting voussoirs and quoins provide a play of light and shade emphasising their three dimensional qualities and in sunlight cast strong shadows and give a lively quality to the facades. In later 18th century windows such details are normally flattened out to give a more genteel and elegant appearance. the indignity of insensitively placed modern street lights piercing the stonework of both facades. Wires loop untidily above ground floor level and more recently two new ​wires have been stretched thoughtlessly between it and the corresponding building on the other side of Ironmonger Street. Its top floor dormer windows are badly boarded up. I have not been able to gain access to see if there is anything left in the way of 18th century mouldings, panelling, banister rails etc above ground floor level, although I suspect it is all long gone. But in spite of all this, the whole still has great presence and character and, in my eyes at least, is one of our very best Georgian buildings. When so many weak and watered down versions of badly proportioned neoclassical houses are being erected in the town, we should be cherishing those that survive from earlier times. 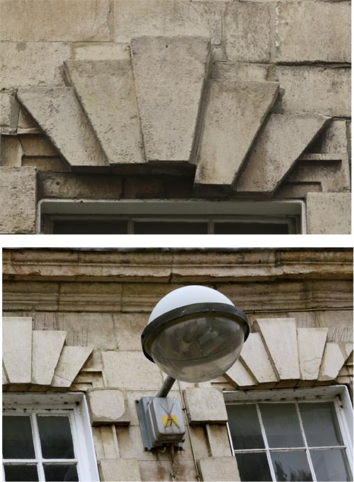 Tourists come to Stamford partly to see its wonderful architecture, and we should not be putting up with the drip feed of lazy thinking and quick fix solutions that are eroding our built heritage. Go and look at my favourite building, have a delicious coffee in Café Black, sit outside, look around and think how much more attractive all our best Georgian (and other) buildings would look with just a little bit of informed tender loving care. We certainly don’t want a town stuck in aspic but one that meets the needs of its inhabitants and visitors. Let’s be aware of just how easily our best buildings can become shabby and abused. It is our town. All of us should lobby to ensure that it is pleasurable to look at. This includes Town and District Councils, bodies such as the Stamford Civic Society, the Urban Group, our various community groups and all of us who live and work here. I do not mean merely prettifying the town centre but tending the structures that are its framework. After all we don’t want tourists to go away feeling just a little disappointed.